Yulia Tymoshenko, who played a major part in Ukraine’s Orange Revolution, is typically regarded as one of the most high profile pro-western figures in Ukrainian politics. Taras Kuzio argues that despite this reputation, her policies on a number of key issues are at odds with her pro-European image. Vox Ukraine, a well-known and respected Kyiv think tank, has become a thorn in the side of all Ukrainian politicians. This has been particularly the case when it comes to checking the veracity of politicians’ comments and official statements and then fact checking them. Until the Euromaidan Revolution, Ukrainian politicians would often get away with deception, lies and claims on facts that were wrong. This is no longer the case. 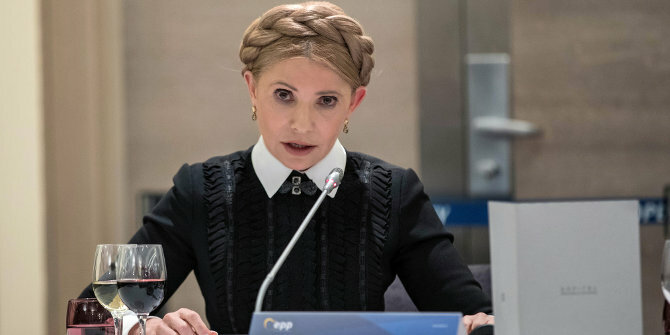 Yulia Tymoshenko was recently ranked first place by the think tank as Ukraine’s ‘biggest liar’ in what they called the ‘first ever ranking of populists and liars in Ukrainian politics’. Another three figures to feature on the list were from the Opposition Bloc (former Party of Regions): Vadym Rabinovych (2), Yuriy Boyko (3) and Oleksandr Vilkul (4). In fifth place was the leader of the Samopomych (Self-Reliance) faction in parliament, Oleh Berezyuk. That three of the five biggest liars in Ukrainian politics are from the Opposition Bloc (associated with discredited former President Viktor Yanukovych) is not that surprising. But, the fact that first and fifth places were taken up by pro-Western politicians (Tymoshenko and Berezyuk) should give us cause to wonder whether they and the political parties they represent are really committed to European values. Tymoshenko’s socialism and populism is most clearly seen in her strident opposition to land privatisation and foreign investment in Ukraine’s gas pipelines. She has been the most vocal Ukrainian politician in calling for an extension of the existing moratorium on land sales, warning that otherwise ‘there will be a huge civil war by the agrarian mafia against farmers’. She is also leading a campaign to collect signatures to hold a referendum against land reforms which she at times equates with a coming famine or worse. Her mobilisation of opposition to land reforms has scuppered the chances of it taking place prior to next year’s elections, as had been hoped. Tymoshenko is opposed to any foreign investment in gas pipelines, Western or Russian. Indeed, she portrays European management of the country’s gas pipelines as a major defeat for Ukrainian national security. Other actors believe that Ukraine, as a member of the EU Energy Community, should encourage European investors in order for its pipelines to continue to be commercially viable as Germany builds the Nord Stream 2 pipeline to Russia. In 2006 and 2009, Ukrainian-Russian gas conflicts led to crises in the supply of gas to Europe. Tymoshenko claimed that the pipelines were being transferred in secret to an unknown foreign entity. In reality, it is the Ukrainian government that decides on the outcome of the tender by foreign companies (ten European companies have already expressed an interest) wishing to manage 49% of Ukraine’s gas pipelines. This is then ratified by parliament. Batkivshchina, Tymoshenko’s party, voted unanimously for the law on the gas market (though she missed the vote). The foreign company chosen by the government can only be a member of the Energy Community or the US. As Russia is not a member of the Energy Community, and has always been strongly opposed to it, no Russian company can participate in the tender. Therefore, Tymoshenko’s claims that there is no guarantee the pipelines could not be transferred to Gazprom control is unfounded. There is no question that Moscow has always, irrespective of who was president, wanted to regain control over former Soviet gas pipelines and was successful in Belarus, Armenia and much of Central Asia. All Ukrainian presidents – except Yanukovych – opposed a Russian-dominated gas consortium. Yanukovych promised to take this step as part of the December 2013 deal when President Vladimir Putin gave Ukraine a $15 billion “loan”. Creating a Russian-dominated gas consortium was part of Putin’s strategy to maintain Yanukovych in power in the face of popular protests, ensure his re-election in January 2015 and have Ukraine join the CIS Customs Union which in that month was renamed the Eurasian Economic Union. Putin’s plans were never realised because Euromaidan revolutionaries came to power in February 2014 when Yanukovych fled from Ukraine. Ukraine’s legislation and the Energy Community requires the splitting into separate parts of its gas sector. The gas pipelines will therefore no longer be managed by the state gas company Naftohaz Ukrayiny. Ukraine’s gas pipelines will continue to remain in state hands, but their management will be undertaken by a foreign company. One of the six Tymoshenko myths about the gas pipelines that Vox Ukraine debunk is her confusion in conflating privatisation and management, and her many speeches on this topic show that she fails to understand the difference between management and ownership. She has also exaggerated the value of Ukraine’s gas pipelines by indicating this was 30 times larger (300 billion euros) than a valuation made by the accounting company Ernst & Young. That the pipelines are not planned to be sold makes this a non-issue. There is no plan for the government to privatise the pipelines to foreign owners and a foreign company would manage pipelines that remain in state hands. Tymoshenko obfuscates the difference in the pursuit of a populist agenda portraying herself as the “defender” of Ukrainian sovereignty and security facing down nefarious corrupt elites. Tymoshenko claims that foreign management of the pipelines would lead to Ukraine losing $3 billion a year from transit fees. Again, this is not true, and both the European manager and Ukrainian government will receive profits; although the amount earned by Ukraine will decrease. In their article, Vox Ukraine outline four advantages for bringing in European management. Firstly, this would revitalise Ukraine’s gas pipelines. Secondly, European consumers would continue to be interested in buying gas transported through Ukraine’s pipelines. Thirdly, it would end the monopoly of Naftohaz Ukrayiny over Ukraine’s energy sector. Fourthly, it would reduce corruption in the gas sector, where it had always been present until the Euromaidan Revolution, and increase transparency. Finally, it would lead to the bringing to Ukraine of foreign experience and international corporate practices. Tymoshenko is opposed to a large number of reforms in land, energy, health care, and pensions which are promoted by the IMF and Western governments in return for financial assistance and required under the EU-Ukraine Association Agreement. Her rhetoric and statements are incompatible with Batkivshchina’s membership of the centre-right European People’s Party (EPP) and are undermining her image as a pro-Western political force. Taras Kuzio is based at the Department of Political Science, National University of “Kyiv Mohyla Academy” and is a Non-Resident Fellow at the Center for Transatlantic Relations, Johns Hopkins University – SAIS. He is the author of Putin’s War Against Ukraine. Revolution, Nationalism, and Crime (2017) and co-author of The Sources of Russia’s Great Power Politics: Ukraine and the Challenge to the European Order (2018).